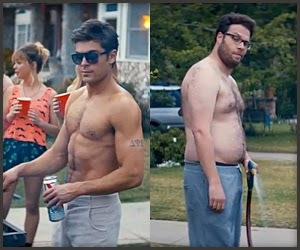 "Neighbors" confirms several things. First, Seth Rogen's improvised comedy never fails to make me laugh out loud. Secondly, "kids" these days are big time into EDM and weed. Finally, Zac Efron is an Adonis. This film is in the same bloodline as "This is the End" and "Knocked Up" - glorifying mushrooms, lots of F bombs, and absolutely hilarious sequences. The improv is so apparent (and fantastic) that you wonder if there was even a script to begin with. Seth Rogen and Rose Byrne are new parents Mac and Kelly, who get a surprise when their new neighbors turn out to be none other than the brotastic fraternity Delta Psi, with Teddy (Efron) at the helm. After struggling with maintaining an appearance of being the "cool parents," Mac and Kelly wind up calling the cops after several nights in a row of Delta Psi's partying. War ensues. Notable scenes include a Robert DeNiro party, the climactic fight scene, and a "milking" incident (I'll leave it at that.) I was excited to see so many cameos - Lisa Kudrow, Ike "Morgan Tookers, RN" Barinholtz, Andy Samberg, Jake Johnson - in my mind, comedians are all best friends and guest star in each others' movies for free, for fun. I'm so jealous. One prank tops the next, and after some seriously absurd antics, these new parents realize they don't miss their partying days, they're just a bit bored and having trouble adjusting to their new role in life. The bros discover that beer pong scores (and scoring in general) won't matter after graduation, and resolve to seek out their own destinies, even if that includes being a jean model at Abercrombie & Fitch. Everyone grows up a little, but the laughs sure are fun along the way. **I'm so excited to announce that I'll be guest blogging for the Official Fire in the Triad Blogger, Nikki Miller-Ka, at next Tuesday and Wednesday nights' battles! Check out her blog, and read more about Competition Dining here! Nikki live tweets during the battles and blogs about them the next day. If reading her recaps don't make you salivate and purchase tickets immediately, seek medical help.